BET Owned Social! " THE BET SOCIAL AWARDS" was the biggest celebration of the genre EVER! Music and television stars Erykah Badu, Tony Rock, Justin Combs, Amanda Seales, Reginae Carter, Symone Sanders joined social superstars Kash Doll, Blame it on Kway, La La Sizahands, Amara La Negra, Jess Hilarious and more to set the inaugural social kudofest on fire! 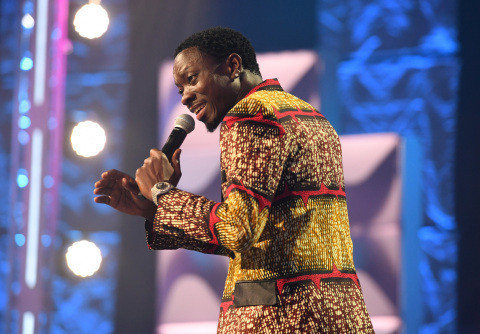 The African king of comedy Michael Blackson hosted the show live from Tyler Perry Studios Ft McPherson in Atlanta. Executive produced by Mike Epps, this first-of-its-kind awards show celebrated all things social media over the past year. Watch all the must see moments now at BET.com/Social and on social platforms by following the hashtag #BETSocialAwards. In case you missed the show LIVE, catch an encore airing of "THE BET SOCIAL AWARDS" Monday, February 12 at 10 PM ET/PT on BET. The night opened with a high-energy medley of the top dances of 2017 starring social media sensations Blame it on Kway and Lala Sizahands followed by Michael Blackson who took the stage with an African-inspired dance number. From President Trump to Tyrese to Kevin Hart, nobody was off limits - including Blackson himself. He was joined by his "For the D and P Challenge" co-star Erykah Badu who roasted Blackson's outfit, as she took the stage to present the 'Issa Wave' award. The night honored the celebrated hashtag #BlackGirlMagic with a spoken word tribute by comedian and actress Amanda Seales and "THE BET SOCIAL AWARDS" honored the founders of the Women's March, organizers Tamika D. Mallory, Bob Bland, Carmen Perez and Linda Sarsour. Actor and comedian DC Young Fly was given the Social Verified Award by Executive Producer Mike Epps. Performing live, femcee Kash Doll ignited the crowd with her hit "For Everybody", while YFN Lucci closed out the show with a medley including his mega-hit "Everyday We Lit." Additionally, viewers received an all-access pass to all of "THE BET SOCIAL AWARDS" action with the BET It Girls: Jasmine Luv, Leomie Anderson, Sandra Lambeck and Jasmin Brown, who took their followers into the ultimate VIP adventures through Atlanta and also gave fans a full 360 degree look at " THE BET SOCIAL AWARDS" with the exclusive 360 Facebook Live during the LIVE broadcast. Gone are the days of record sales reigning supreme! To be the most influential social artist, you need streams, likes and views — these bubbling artists nabbed all 3. Now the question is, who's wavy enough to take the crown? #BookedAndBusy! These influencers are the definition of "no days off." From sliding onto our timeline and into our hearts, all while securingthe bag, that's a true hustler mentality. Vote now for your favorite! Social media is the new frontier of comedy and these nominees always keep us laughing 24/7. From their hilarious posts to their ability to pick us up when we're down, these nominees take the cake for best social media comedians. Who served up the best kiki? If you troll, they're trolling back! Internet beef is nothing new, but when these nominees let loose, the whole world notices. From clever reads to snatching edges, these nominees are known to put people back in their place. Whose clapback game was the strongest? Pop in your headphones, you're in for a treat. These podcasts are the voice of the people, and we want to know which one is your favorite! Let's celebrate the memes and gifs that came out of nowhere, took over our timelines and showcased clever moods, shade and subs we didn't even know we needed. These power couples epitomize #relationshipgoals and we're here for it! Rep your favorite couple and vote below! For updates and more information about "THE BET SOCIAL AWARDS" and to vote for your favorites please visit BET.COM/SOCIAL. Join the conversation on all social media platforms by using the hashtag: #BETSocialAwards. Produced by BET Networks, "THE BET SOCIAL AWARDS" was executive produced by Mike Epps, Kyra Robinson and Eric Conte. BET Networks, a subsidiary of Viacom Inc. (NASDAQ: VIA, VIA.B ), is the nation's leading provider of quality entertainment, music, news and public affairs television programming for the African-American audience. The primary BET channel is in nearly 85 million households and can be seen in the United States, Canada, the Caribbean, the United Kingdom, sub-Saharan Africa, France and South Korea. BET is the dominant African-American consumer brand with a diverse group of business extensions including BET.com, a leading Internet destination for Black entertainment, music, culture, and news; BET HER (formerly CENTRIC), a 24-hour entertainment network targeting the African-American woman; BET Music Networks - BET Jams, BET Soul and BET Gospel; BET Home Entertainment; BET Live, BET's growing festival business; BET Mobile, which provides ringtones, games and video content for wireless devices; and BET International, which operates BET Networks around the globe.